This was our third summer renting this cabin. It is a basic, dog friendly, no frills lakeside cabin with a nice screened porch overlooking the lake. The best feature is the privacy. 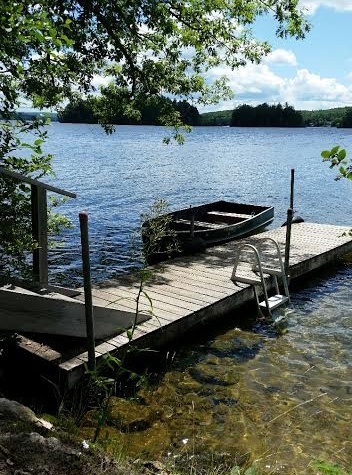 Unfortunately this summer was not as private as before due to a large group of people using the adjacent boathouse and dock which is on the same property as the cabin. Several times cars drove down the cabin driveway to disgorge people who then walked through the woods to get to the boathouse. These events kept our dog on high alert and made us feel a little less safe and secluded than in the past. We still recommend the cabin, but the experience can vary depending on whether people are using the boathouse. Note the cabin is not stocked with expendable items. Expect to buy toilet paper, paper towels, dish soap, charcoal, etc. I was so relaxed my darling husband had to take my pulse. Marni, Deke and Mr. Claque made certain we were well taken care of and I thank them. We loved the quiet and privacy of this rustic cabin. The access to the lake was perfect and we spent many hours on the dock. Our dog was able to join us, explore the property, and run relatively free. The cabin was spacious enough for our family of three. The screened in porch was very convenient. The owners provide a fresh water dispenser for drinking and cooking, and we found the cabin to be adequately supplied with general household needs. You must understand that this is an older home but we found it to be a perfect for our needs. 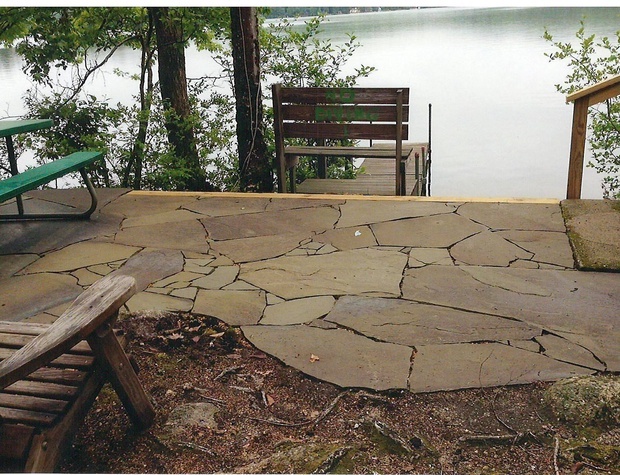 I doubt you can get this kind of privacy and lake access at any other spot on the lake for this price. There were a few issues with ants, a mouse, and the wifi, but nothing worth bothering the management. We enjoyed renting a small fishing boat and would rent one for multiple days if we stayed here again. The patio was perfect and we used the charcoal grill several times. We had a great time in this very rustic little cottage. My grandchildren loved catching the fish and turles. There was a mother duck and her 6 babies who visited us every day. We did have a leak in the roof which the owner fixed the next day. They were very responsive. Some of the mattresses were better suited for kids, uncomfortable for adults. Some pots, pans and dishes were greasy and not properly cleaned. You’ll want to bring a big flashlight if you plan on going out at night because there are no outside lights and plenty of tree roots to trip over. Wished there would have been a beach area to walk into the water rather than climbing down a ladder from the dock or walking thru the woods. Overall we had a great time and we would rent it again. We LOVE this rental property and look forward to returning in the following years to come. The quiet & secluded wooded area and really make’s you feel like you have stepped out of the world and into a calm and peaceful serenity. You can’t get much more “Lake Front” than this!! We had an (another) unbelievable week here. You just can’t beat being right on the water. Perfect for paddle boarding: very little boat traffic and because it’s right on the water I could just jump on my board at a moment’s notice.Had some incredible early morning paddles.Very quiet and private location. Perfect for swimming, sitting on the dock, grilling on the patio and close to everything.